Well, sure, this garage is kind of a mess. But messy garages aren't that uncommon, so... Wait. Um... anyway, can I fix you a sandwich? I'm afraid to ask what he died of. It's been a little slow at work recently. Thanks for helping pass the time! Do I want to know what that is hanging from the ceiling? I think it is decidedly unfair to call this a fixer-upper. Clearly, the owner was a meticulous house keeper with a place for everything and everything in its place...and I do mean everything. The owner was obviously a staunch environmentalist who abhorred sending anything to a landfill – preferring to recycle architectural components as well as the mundane cans and bottles. I wonder if it has been in this condition since the last major earthquake in SF. No, T, I really don't think you do. 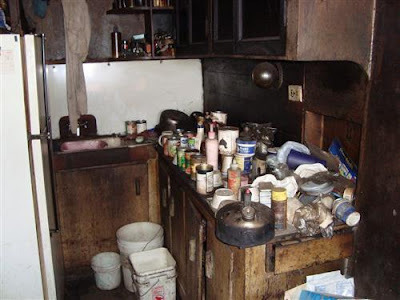 Looks like a meth lab! anonymous: some of them are bank-owned, which means they were foreclosed. The San Francisco real estate market is officially INSANE!!! $429,000 and you must enter at your own risk. I still have no idea what the outside of this house looks like...is it that slanty building? I have a horrible feeling the "decedent" is still in there somewhere. I was going to take a guess at location but frankly could be anywhere! oh LOL: "enter at your own risk"
Sweet fancy St. Joseph, that is NASTY! I always assume that realtors are trying to hide something about the property. If a realtor writes "Enter at your own risk," and shows pictures like that, what could they possibly be hiding? What I can't believe is that you posted the best photo of the batch! "Enter at your own risk. " it says on the listing. What a steal at $429,000! Seriously, how does ANYONE afford living in San Francisco?? SF is a wonderful place, but this is nuts. How could anyone afford this and fix it up to live in unless they made several million per year? Jayne - isn't that the decedent in the tub? That's not a fixer-upper, it's a tearer-downer! What's hanging from the ceiling? I think those are stockings that are drying. However, that would imply that someone actually washed something in that kitchen. So, yeah, I got nothin. how frightening that this seems to be the least offensive photo of the bunch! YIKES! Yes please, PBJ. Only don't make it over near the buckets, I think the ceiling is leaking and I HATE soggy bread! I can only imagine the smell. Hold me! So this is where E.Coli lives. Wonder if Samonella is a room mate? So do all the lucky lookie loos get a tetanus shot before they enter? That seems like a reasonable perk to offer at the "open house," no? I would've died too, just to avoid having to clean it up! Wait - what exactally ARE they selling?? Are we suure its a house?? can I fix you a sandwich? May you? Certainly. Can you? I doubt it. What no one complaining about the price has pointed out is that this house is 460 square feet. 3 rooms. Which means that in each pile of scrap must be something worth about $150,000. Maybe this is the wheelhouse of that uranium mine I always thought was in Visitacion Valley. Wow, we're all going to be rich! I had no idea my uncle owned a house in San Francisco. Well,hey you get to keep all that stuff, plus all the stuff in the ... living room (?) all for only what a mere $429k. I think if I had to buy this house, I would end up living in a hot air balloon tethered safely above the property. OMG! that is soooo gross!!! how could one live in a home like that??? Most junk yards are outside, but these people are no-conformists and keep theirs inside where it's safe and dry.